Top Ten Tuesday is a weekly feature/meme now hosted by That Artsy Reader Girl. The meme was originally the brainchild of The Broke and the Bookish. 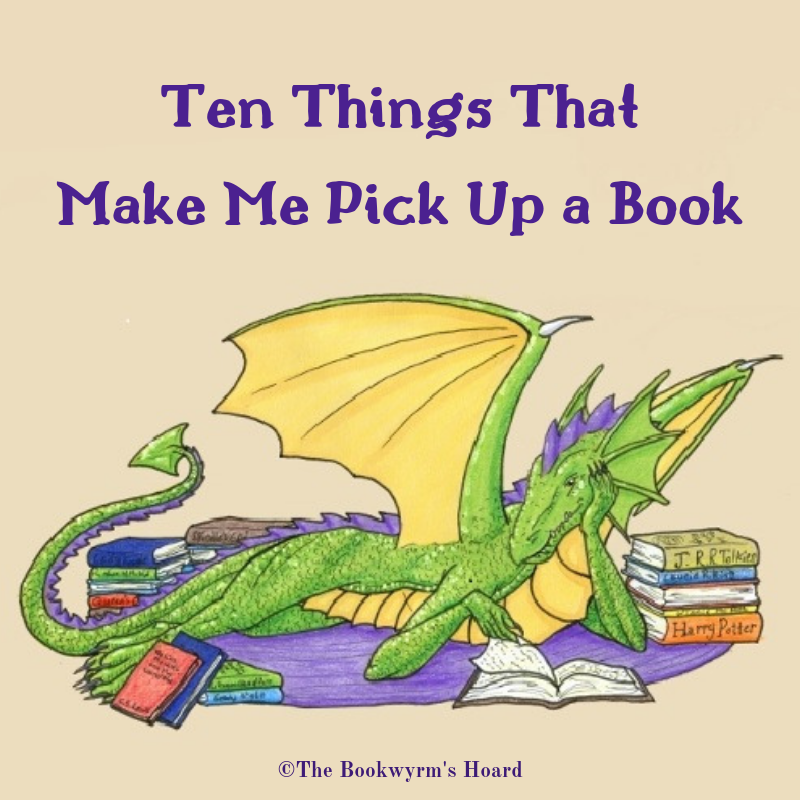 This week’s topic is Ten Things That Make Me Pick Up a Book. I realized after I made this list that most people made their TTT list about the sort of things they like to read about. My list is more general, I guess—it’s what might make me pick up any book in a genre that appeals to me. 1. An author I love. If I loved their previous book(s), I can’t wait to read the next one. And when I discover a new-to-me author with a backlist, I often binge my way through the backlist—or as fast as the library can supply my habit, anyway! 2. A series I’m already reading. Trilogy, sextet, or ongoing series—once I’m hooked, I’m going to keep going. And it would have to get pretty bad for me to give up on a series I’m in the middle of. 3. A recommendation or rave from someone with similar tastes. Especially if they know my tastes. If Robin, my mom, my sister, or my novel-writing friend recommends a book to me, I know I’m probably going to like it. 4. A great cover. No cover is ever going to make me read a book if other factors don’t appeal to me, but a gorgeous or attention-grabbing cover will usually make me take a closer look. 6. A blurb or review from an author I love and trust. If Tamora Pierce or Stephanie Burgis or Laurie King tells me they loved a book (and why), that weighs heavily in the yes, read it column for me. 7. A comparison to a book or author I love. This one’s tricky, because I’ve been burned by these before. It’s not going to make me read the book, but it will probably get me to give it a deeper look. 9. Extras. Like maps, floor plans, glossaries, illustrations, character lists… things that help me understand the book and its world better. Again, I’m never going to read a book solely because it has a cool map, or ignore a book because it doesn’t. But extras like this tell me that the author and publisher put some care into the the book, and that counts for something. It’s always cool to look at the extras, especially the maps. What a fabulous answer. Yes, exactly. Extras won’t make me buy a book I don’t want to read, but they can tip the balance… or make me decide to buy instead of borrow, if the extras are in some way separate from the book. All your reasons are great and actually I think I’d tick every one as something that guides me too. I can sympathize with all of these. And I’ve also been so burned by comparisons, but they still pull me in (with caution). #5 is kind of obvious but for some reason I forgot about it. But if a book is strongly recommended I might give it a chance even if the synopsis doesn’t sound that great. I did not think about #9 (Extras) because I tend not to read books that require a lot of background in the first place. But sometimes I do, so those can be helpful.